Anyhoo – onto the wine of the week! 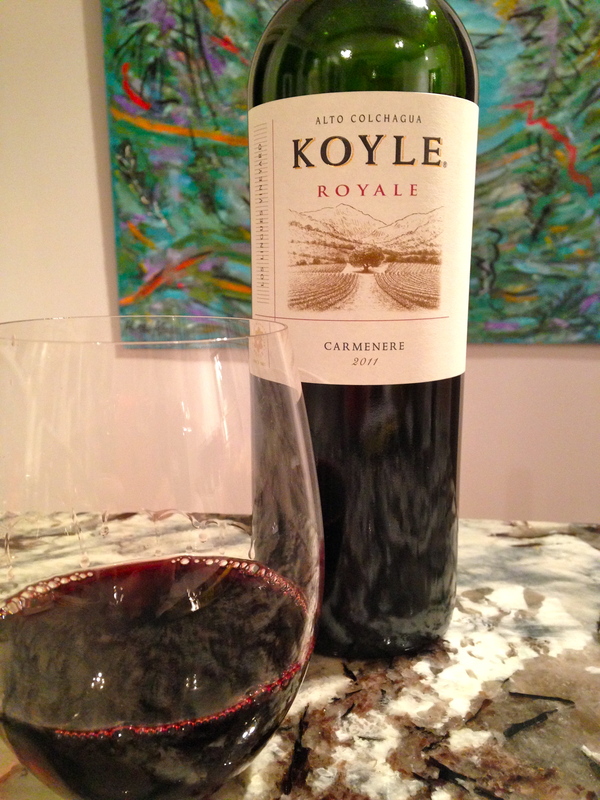 On deck, I have Koyle Royale Carménère 2011 from a biodynamic vineyard located in Alto Colchagua, Chile. For over a century in Chile, Carménère was believed to be Merlot. Cuttings of both plants were imported from their original home of Bordeaux. It was not until the 1990’s that researchers proved the grape to be Carménère and it was officially recognized by Chile as a distinct varietal…yay for us! Koyle Royale Carménère is full bodied at 14.5% abv and is deep ruby-crimson in the glass. On the nose, there is a stunning bouquet of white and black pepper, liquorice, clove, nutmeg along with black cherry and ripe plum. HELLO! It is medium in acidity and boasts medium velvet tannins. On the palate, all the aromas are present which makes for a glass full of pure delight. This is an outstanding wine. A 100% GGG ‘Hell Yes’ and I could not be more thankful to Lori and Ken Larsen for this stunning bottle of wine. The retail on this bottle is $29.99 so it is not your cheap and cheerful Monday night wine. No…save this one for a Saturday or Sunday special evening meal. It is also the perfect bottle to bring to a dinner party for some bragging rights and kudos! That is it for me this week. Will you be attending the Vancouver International Wine Festival? Is so, let me know what you will be attending and when. Looks and sounds yummy Christine – going to go look for a bottle! Thank you!